We have a range of voluntary roles in the Garden. Find out more and apply to join us. 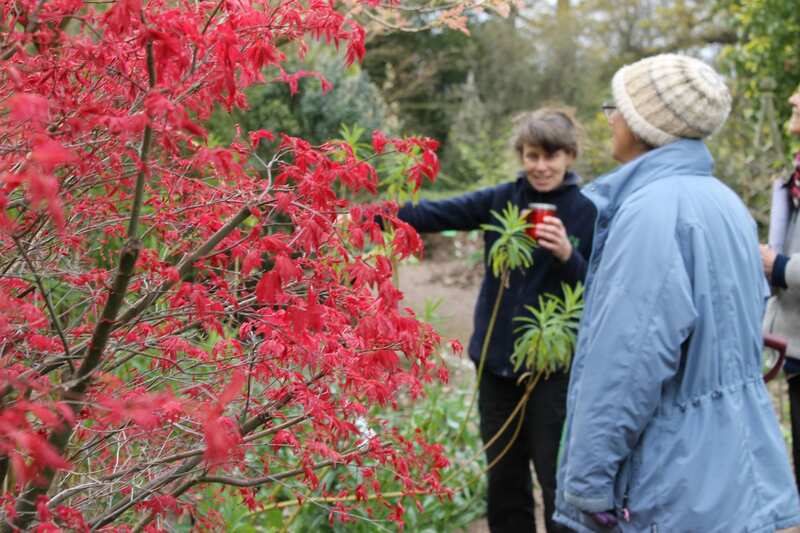 Volunteers are a respected and valued part of the workforce in the Garden. Volunteering is a fun and rewarding way to help the Garden continue to develop and flourish. We are looking for enthusiasm, reliability and commitment. Specialist skills are useful but not essential. General gardening work. This includes border work, edging, weeding, leaf raking, seed cleaning, potting. Welcome visitors to the garden. You would take entrance money, give information about the Garden, the Friends Association, courses and tours. Office/administrative work. You could help with filing, addressing envelopes and other administrative tasks. Lead guided tours. We train some of our volunteers as tour guides for visiting groups. Assist with events. This could include manning an information stand, taking entrance money and helping with teas. You may also help with preparation and clear up. DIY on an occasional basis. Fundraising. Some of our volunteers help us to raise money for the garden. This could involve 'selling' the garden to corporate and private sponsors. People skills and good connections are a distinct plus. Any other useful skills you can offer us. "I love plants (although study Maths) and volunteering at the Garden provides a sanctuary from the pressures of University work."